A story I wrote about in December is receiving some pick-up today, thanks to CNN. A few people asked why I began looking into the BlackLivesMatter1 page, and it started in September when I was researching a fake news site called the Jackson Telegraph. 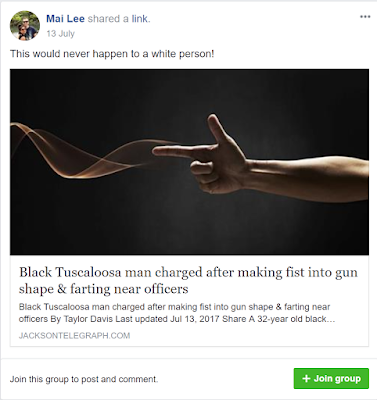 A Facebook user named "Mai Lee" posted a story from the Jackson Telegraph (titled "Black Tuscaloosa man charged after making fist into gun shape & farting near officers") in a Black Lives Matter group. And that group was linked to the BlackLivesMatter1 page. Originally, I was trying to figure out if there was a link between the BlackLives group and the Jackson Telegraph. I don't believe they were linked, although I do suspect the person (or one of the persons) running the Jackson Telegraph was Australian.